From a family full of athletes, this football player decided it was time to make a change in his life to better himself, but his health isn’t the only priority in his life. Luke Coyle, 20, is a freshman linebacker who transferred from College of the Canyons last spring to play football at Pierce College. Just over a year ago, he weighed around 330 lbs. He has since lost around 120 lbs. Coyle admits that he’s always been outgoing and funny and he feels more confident now than ever. Coyle’s friends and family have been there to support him through it all. Two of his close friends are his Brahma teammates Word and tight end Trey Dunkelberger. The Coyle’s are an active family. Luke’s brother plays professional baseball and his sister plays professional softball. But about two years ago, Coyle’s father’s health took a turn for the worse. His father was diagnosed with cardiomyopathy when he was 33 years old and since has been in a constant uphill battle. Throughout Coyle’s senior football season, he could tell his father’s health was worsening. Right after his football season ended, Coyle’s father didn’t feel good and called Luke to take him to the hospital. Fast-forward two years and Coyle’s father is said to be one of the best artificial heart patients his doctor’s have ever had in the United States for this specific device. His father stays active and loves the outdoors. He also comes to all of Coyle’s football games and Luke and his father have become a lot closer. They’ve become closer since Coyle mostly takes his father to his doctor’s appointments even though it causes him to miss some football practices. 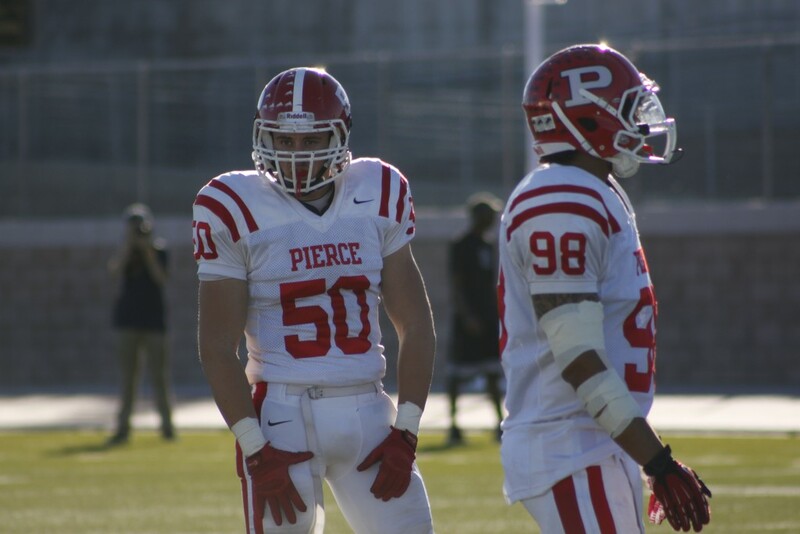 Coyle wants to transfer to a Division I college to play football after his sophomore season at Pierce. Coyle said his father doesn’t want his health to affect his decisions on colleges when it comes to transferring. Next articleAthletic Department hosts food drive for M.E.N.D.